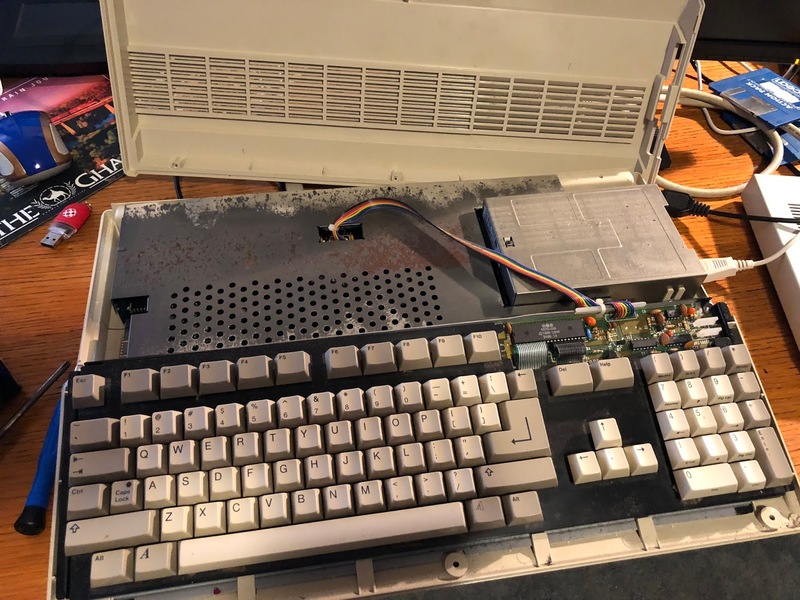 This meant breaking the original seal on this Amiga 500 to take a look inside. All things considered and considering it's age, not too bad. Bit of rusting on the top metal shield, but I don't intend to keep that in place anyway. 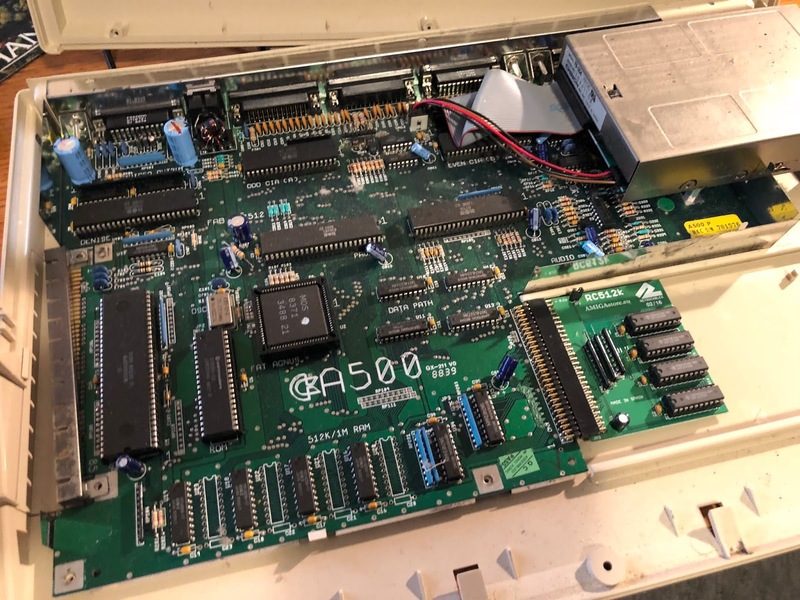 Looking at the revision information on the board reveals this is a Revision 7 board. 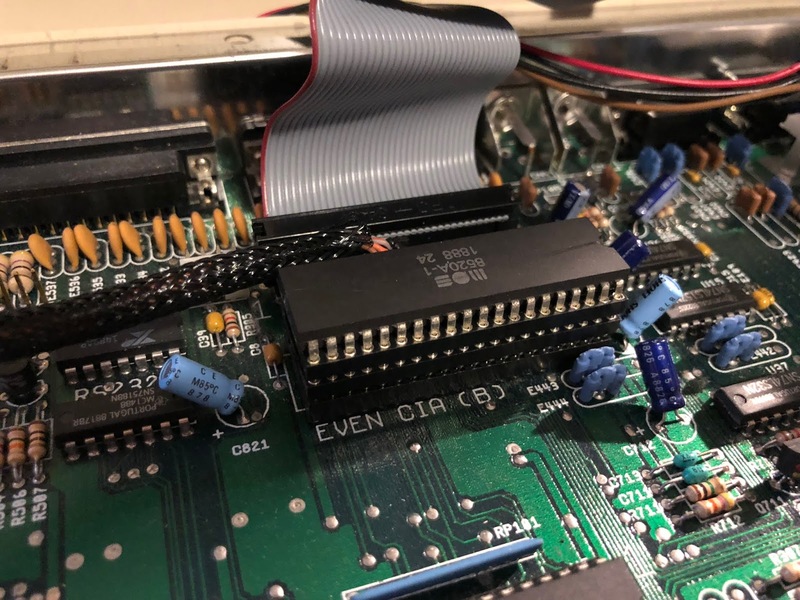 Next, I focused my attention to the Even CIA chip, which needs to be removed to install the DF0 selector hardware switch, with the even CIA chip then placed on top of it. 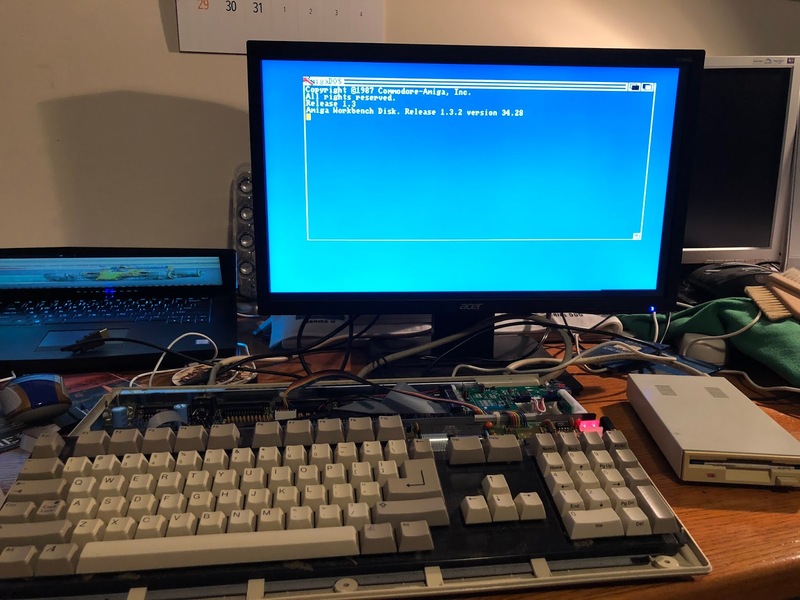 By doing this, I can still boot real Amiga floppy disks using the external floppy drive by flicking the DF0 selector switch to use the external floppy drive port as DF0, rather than the internal floppy drive (now the Gotek). 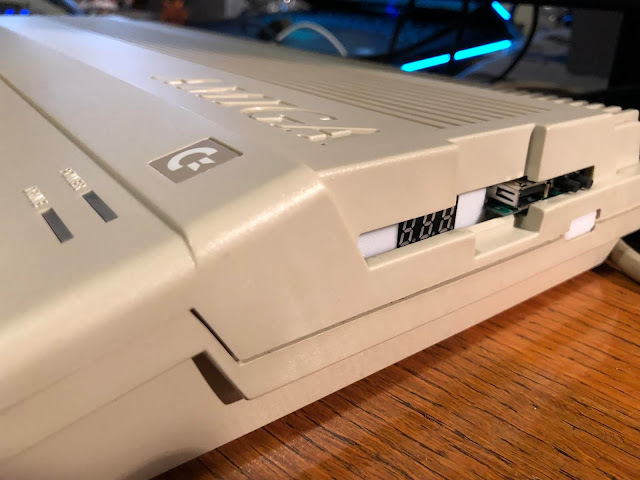 For those not familiar with the Gotek, it is a floppy drive emulator connected to the floppy drive connector, and can boot Amiga .ADF floppy disk image files from USB stick. 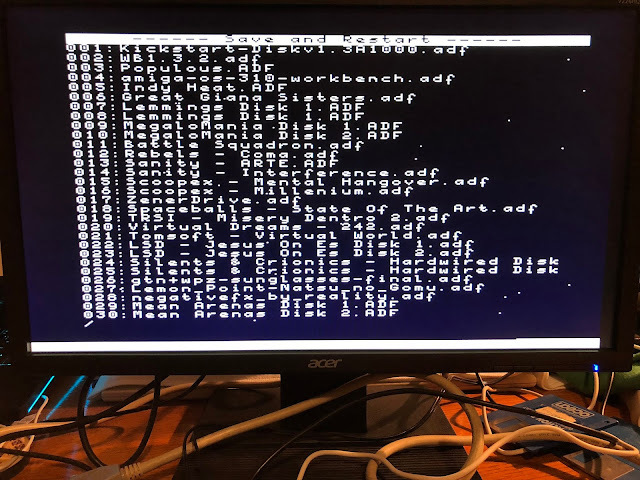 You can select the floppy disks by booting the included selector.adf floppy disk image (set up to use position 000 on the Gotek). 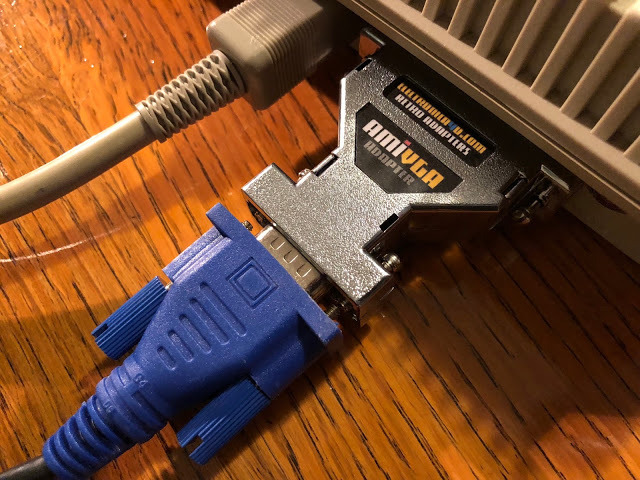 Up until now I have been using the AmiVGA RGB to VGA converter plug and my 15khz compatible TFT display. 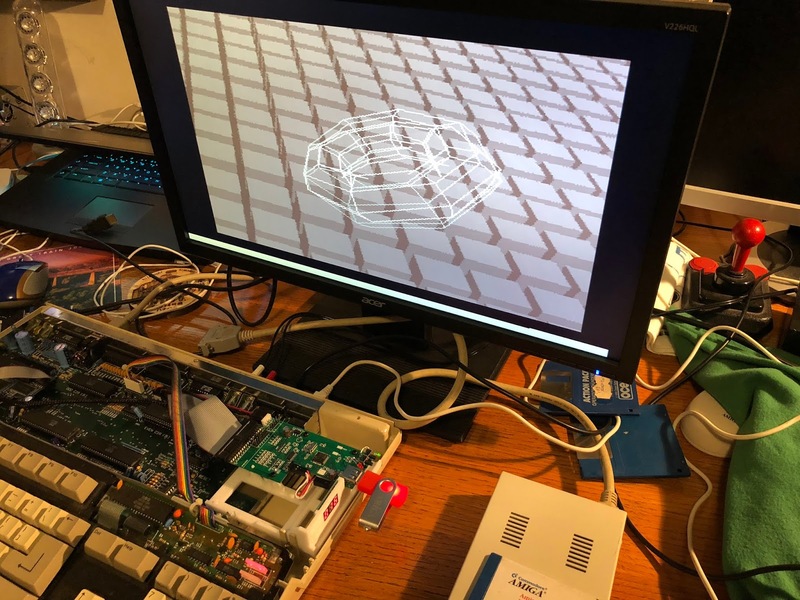 I also connected my ACA500 expansion card on the left side of the Amiga 500, with an Amiga 1200 A1233 030 33Mhz accelerator from Individual Computers plugged into the A1200 accelerator board slot on the ACA500. 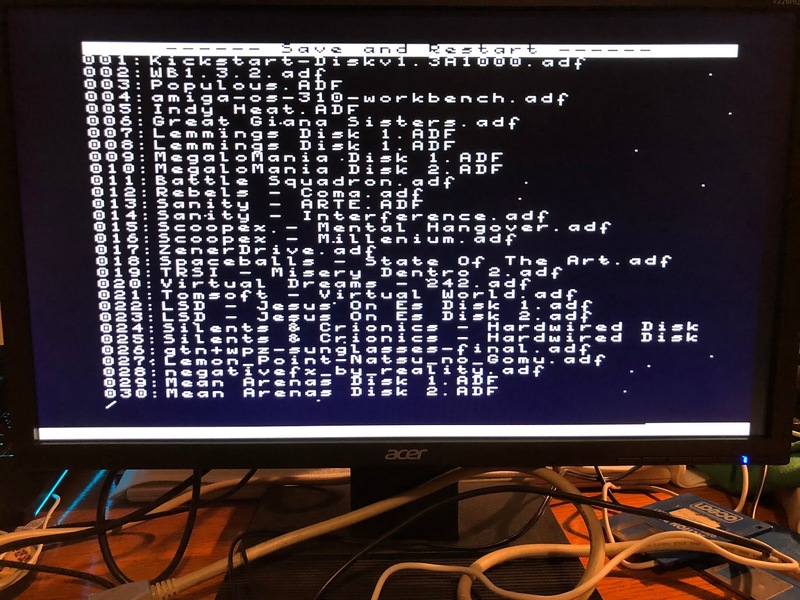 This gives me 030 acceleration, twin CF 4GB hard disk support and 128MB of FastRAM from the accelerator! With the casing back on, things are looking great! The ACA500 also gives me softkick 1.3/3.1 boot support in it's memory without the need to swap the kickstart roms onboard the A500. I can boot in 1.3 or 3.1 mode from a boot selection menu on power up, with plenty of customisation options for the settings for those boots. 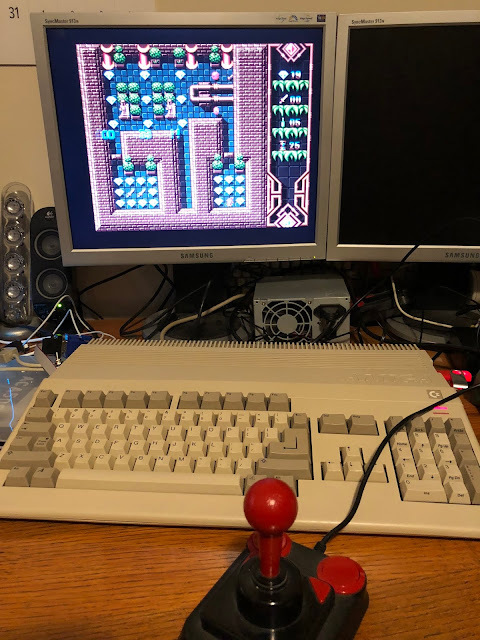 I also connected the Rys II USB mouse adapter to the A500 so I can use a standard USB mouse with the Amiga (no driver needed) and avoid a mouse pad and regularly cleaning the mouse ball on a real Amiga mouse. 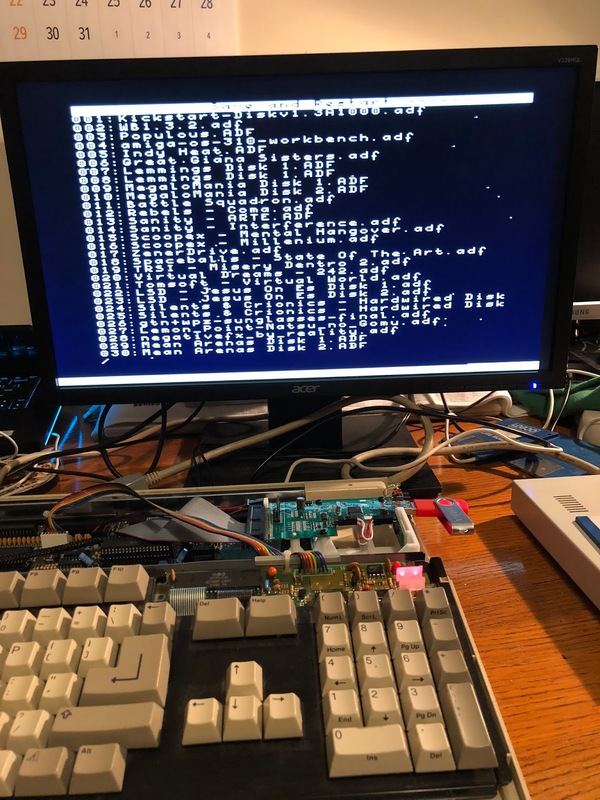 At the moment I use a spare USB mouse from my AmigaOne X1000! 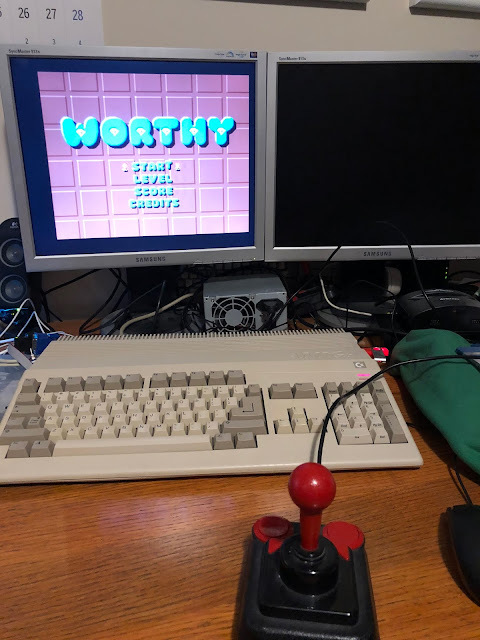 I bought the recently released OCS game called Worthy, and put the ADF onto my Gotek to try it out on the Amiga 500. It is a very nice game indeed. 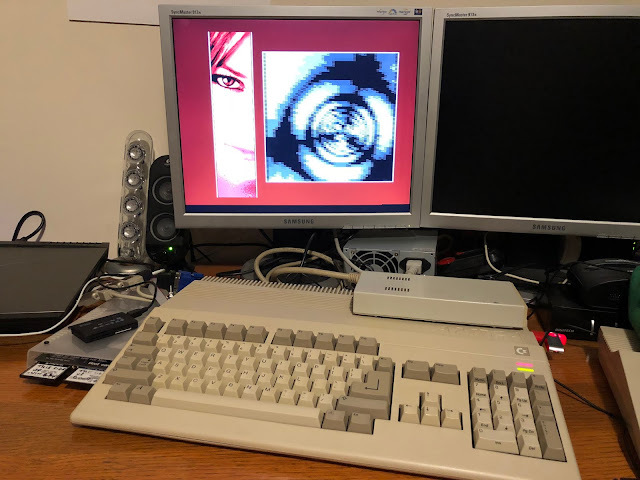 I would love to see more new games for the Amiga. 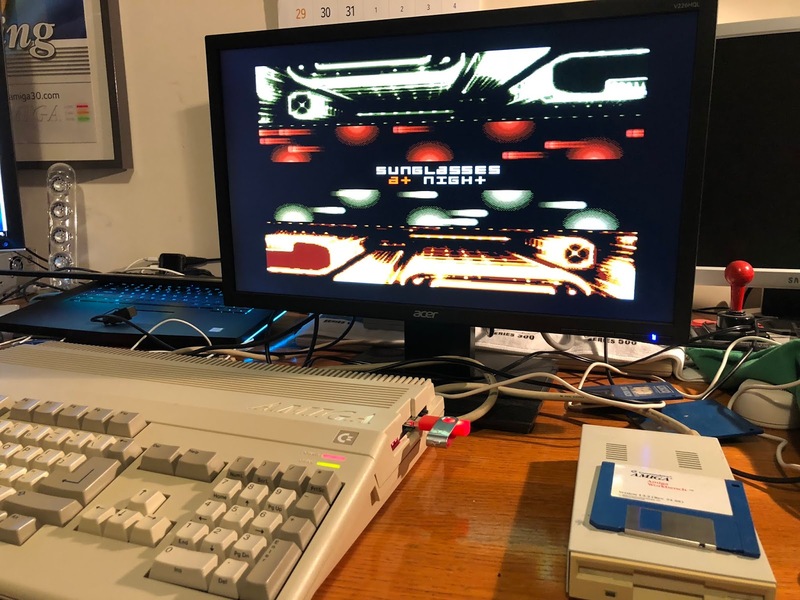 The graphics are classic Amiga, very pretty, good sound and the gameplay is fun too! 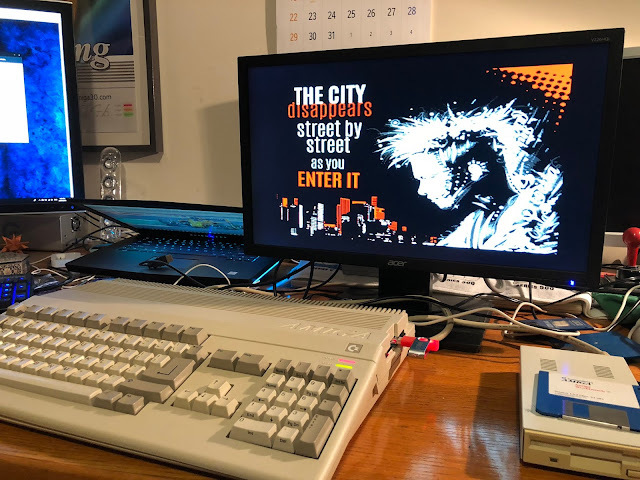 For now my Amiga 500 is where I want it to be upgrade-wise. 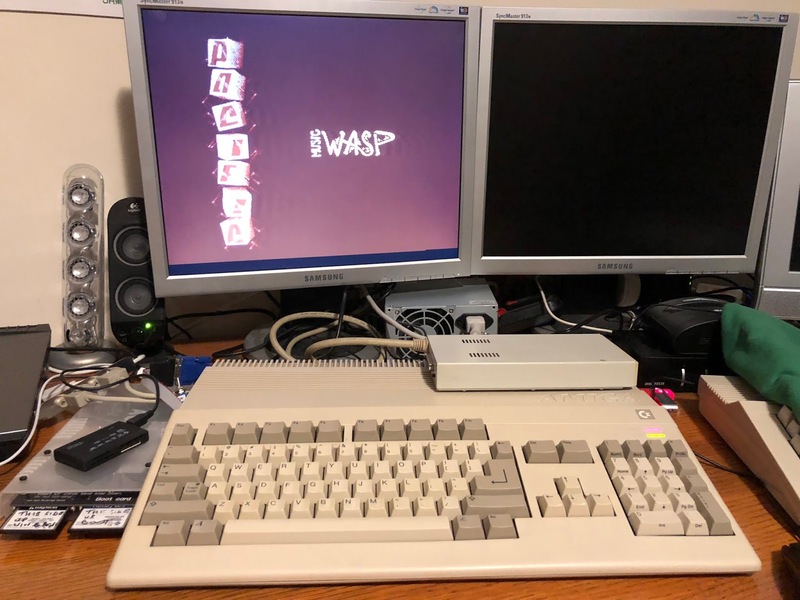 I could install the Vampire 500 V2 into it, but as regular readers know, that is how I ended up with a non-functional Amiga 500 in the first place. I am happy with it at this point. I will leave well enough alone this time! 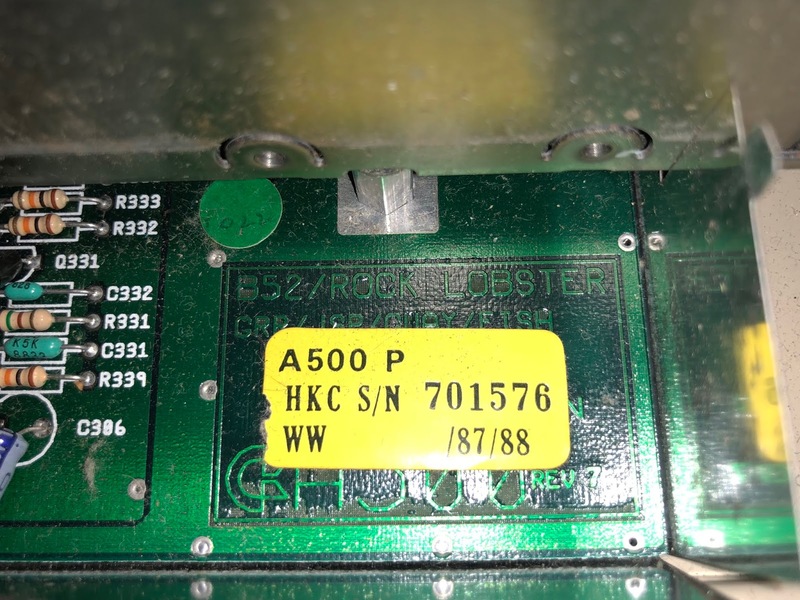 I am giving thought to putting the Vampire 500V2 back into the A2000HD with a CPU slot adapter to solve the previous problem of it being unreliable on the A2000 68000 slot (popping off on cool down needing the case and internal floppy drive frame assembly to be removed every time I powered on). 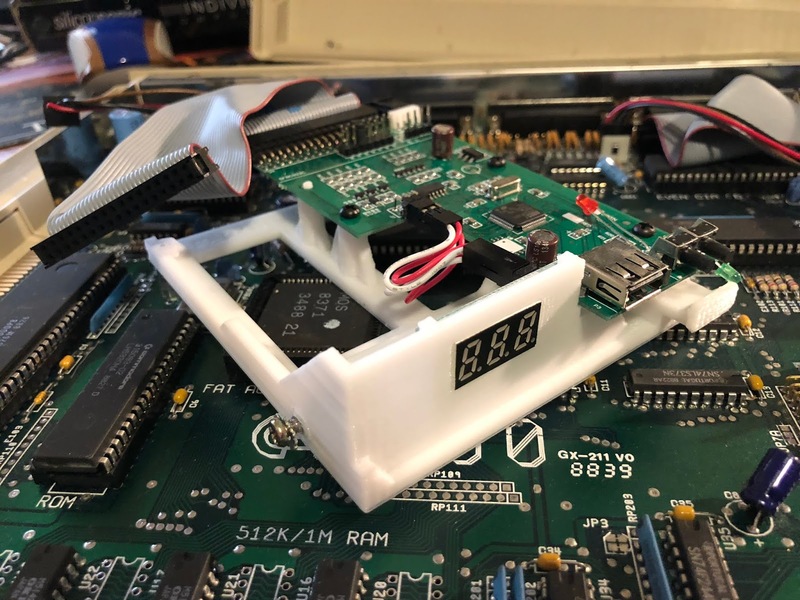 I have recently picked up a CPU slot adapter for this purpose. 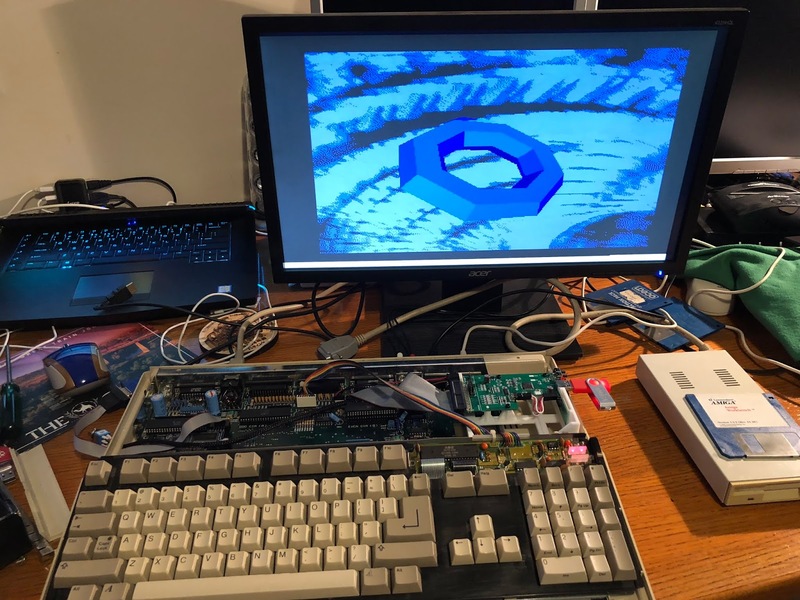 A likely future project when I have free time for it.